Having ordered the Dinnote 200L to upgrade my primary bike light it was time to evaluate my secondary light. Was it worth it, throwing time and money to improve an already good light? Technology has moved very fast in the LED field in the years since I got my light. Searched the web and what do you know an illustrated step by step how-to upgrade the Princeton Tec EOS swapping the LED with a new more powerful/efficient one. After reading too many postings I figured it was an easy job that would require less than an hour and $4.50. Not a bad deal. The instructions I found talked about replacing both the lens and the LED. I would just replace the LED and use the existing lens. Opened the headlamp and removed the batteries. Drilled out the two plastic rivets that hold the whole thing together. Removed the light lens by prying it out with my hands. Moved back and forth the old LED until if came lose from the rest of the light, the two + and - cables still attached to it. UPDATE: I recently upgraded a light for a friend and this time I applied heat with a hair dryer to the "star" and that made separating it from the rest of the light a lot easier. Removed the old LED by applying the soldering iron to the two existing connecting cables. Soldered the new LED into place making sure the + and - where as in the original. Reasembled the whole thing back and fire it up. A couple of days ago I had gone for a night ride and took a photo of the stock Princeton Tec EOS illuminating a trail sign at the beach. 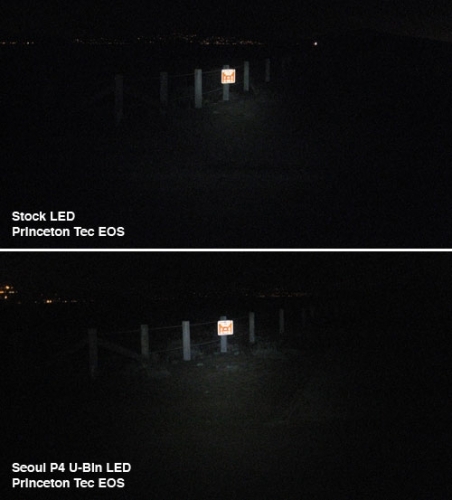 Here are both pre and post "operation" shots of the Princeton Tec EOS beam on the same sign. May not look like much on the photos but believe me there is a significant difference between the old and new. The new light is brighter and still puts a lot of light out in front but it also has more spill, that is, the beam is wider. Probably the best $4.50 I've spent this year in bike stuff. Combined with my new primary light the Dinotte 200L 4 AA they are about just perfect for my longer night rides. It looks like the 2009 lights are going to need an additional modification, the new LED bubble won't fit inside the standard EOS reflector hole.